Decatur, AL — Viking Solutions®, an industry leader in the design and manufacturing of quality outdoor products, is pleased to announce the release of their new Gong Pistol Target Combo which includes a 3/8” thick three inch and five inch AR500 plates. The Viking Solutions Gong Pistol/Rifle Target sets up in less than one minute, allowing the user to quickly set up, shoot and continue shooting until the day is done. The wide base allows it to be placed on any terrain and the powder coated finish provides years of shooting practice. The Crossbar is 25 inches high and the target centers are 12 inches apart. The targets themselves will handle large caliber pistols and most centerfire rifles (3,000 FPS or less at impact). The new Gong Pistol Target Combo has a suggested retail of $54.99 and is available at, http://vikingsl.com/portfolio/pistol-rifle-target/ . 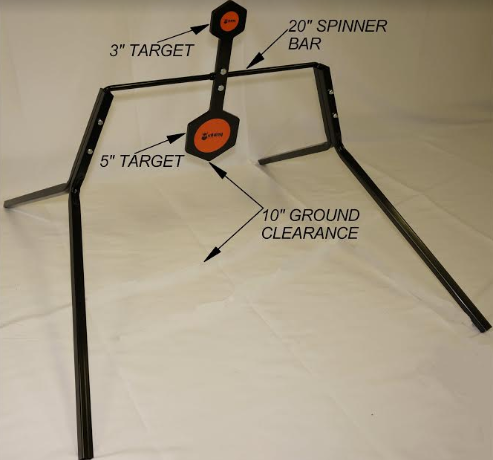 For more information about the Viking Solutions Gong Pistol/Rifle Target, or any other Viking Solutions products, contact Glenn Walker at glenn@providencemarketinggroup.net, or visit www.vikingsl.com. Founded by John A. Woller, John Woller, Jr., and Ron Woller, Viking Solutions is a family owned company with more than 60 years of combined manufacturing experience. Viking Solutions prides itself on the development and creation of products that enhance the outdoor enthusiast’s experience—before, during and after the hunt. For more information about Viking Solutions products, please visit www.vikingsl.com.